Android navigation head unit for Mercedes-Benz C-Class W204 is available now, this navigation unit fits Mercedes Benz W204 C180, C200, C220, C230, C280, C300, C320, C350, etc, inbuilt GPS navigation system, Bluetooth hands free phone calling, Bluetooth streaming music A2DP, USB, SD, Mirror-Link, supporting steering wheel controls and a backup camera with RCA connectors. 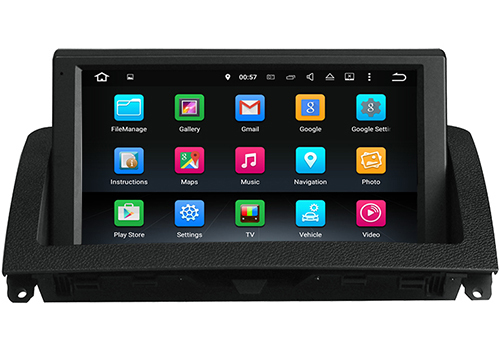 If your Mercedes Benz W204 comes with original 5.8 inch small screen and a working aux function, you can order and install this unit in your car, this head unit can also fit factory 7 inch screen w204 now. If you don’t know if your car has aux or not, you can check our previous post: How to check if my W204 has aux function? 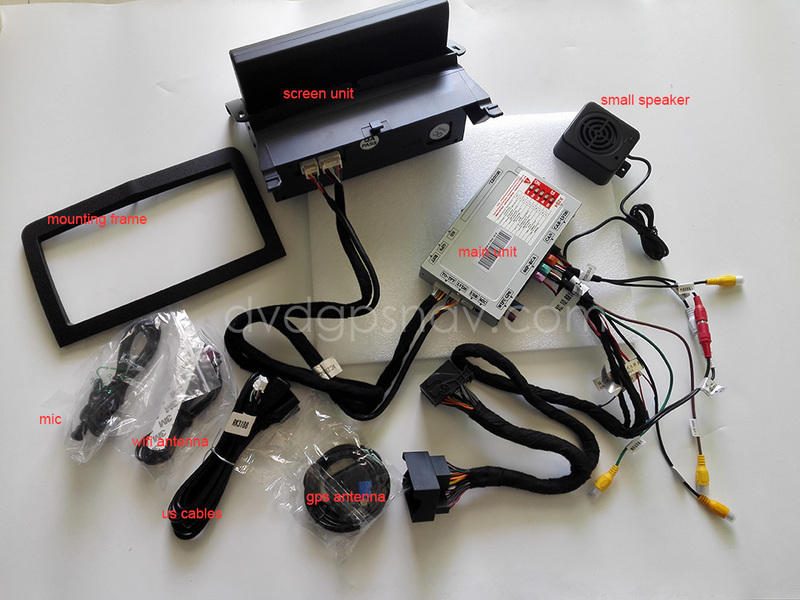 Installation for this W204 Android navigation is more or less the same as the Wince version, if you have check other posts from this blog, you may have already seen How to install Wince version Benz C W204 navigation GPS. 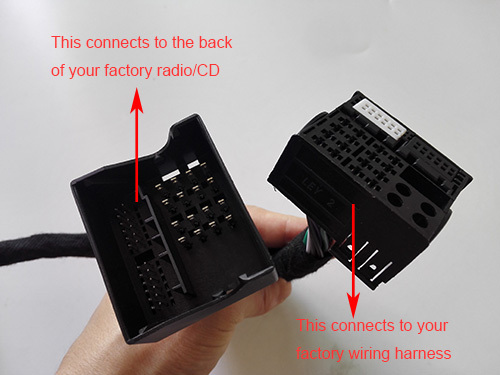 The first step is removing the factory Mercedes-Benz W204 screen unit and radio/CD, then you can connect all cables and install new touch screen W204 head unit in your car. User a special installation tool to remove the central air vents. Unplug the cables behind the air vents, then you can take out the air vent. 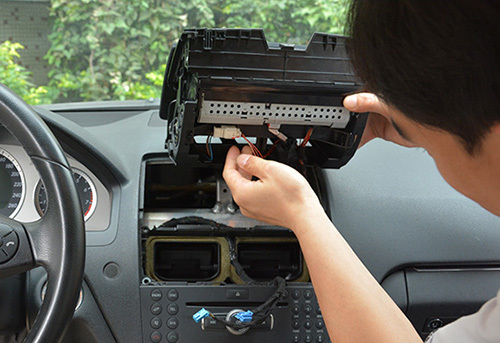 Remove 4 screws to take out the screen unit and radio/cd system. Take out the factory screen unit, unplug cables behind. Take out the radio and cd system, unplug cables behind. So factory screen and radio has been removed and the next step is installing the new W204 Android head unit. 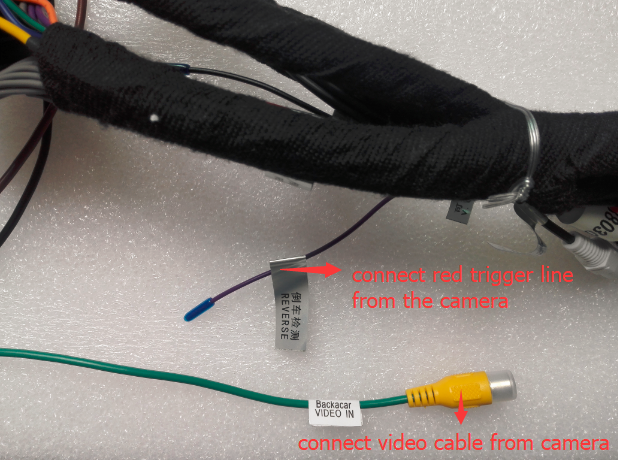 Here are some pictures showing you how to connect new cables. 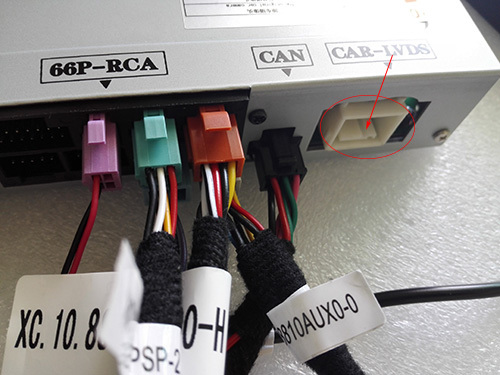 Click the above picture for larger view.You need to connect the white CAR-LVDS plug with your LVDS plug behind your factory screen. 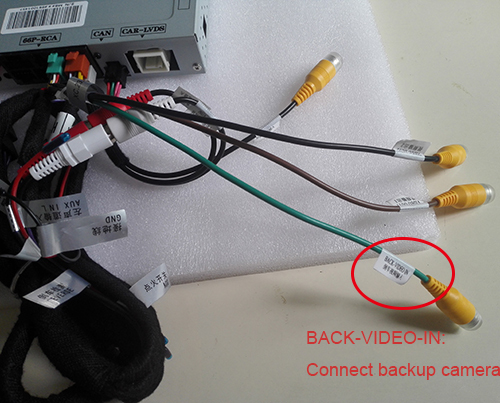 Besides, you should get the power for the camera with 12V reverse light(not from our 12V power), so after you put in reverse gear, the camera can get power and automatically display rear view images on screen. Note: this cable is not included in the package by default, because only very few cars need it. 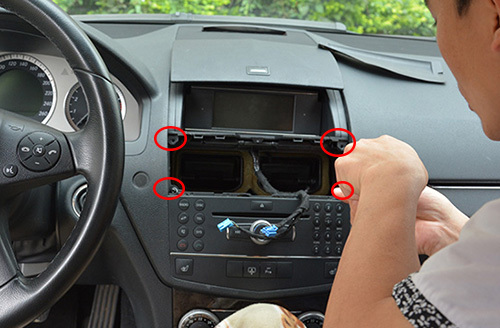 After installation, if you want to listen to radio and navigation sound at the same time, you can try these steps:When the unit displays original radio interface, long press the voice button from your steering wheel controls, then the screen will automatically switch to our GPS function, so that the GPS sound will come out from small speaker, and radio sound comes out from car speakers. Switch from factory menu to new Android menu: just activate and enter into factory Aux mode, the screen will switch to new menu automatically. If not switch, you can check another solution here: How to switch W204 screen to Android menu? If you still have a question while installing, welcome to contact us, our technicians would be glad to assist you. You can follow us on Google+ (https://plus.google.com/+DVDGPSNavigation) to get latest news of our products including new arrivals, installation instructions, etc. Or follow and talk with us on facebook. Hi what is the factory password for this unit ? We don’t suggest you enter into factory settings to avoid any wrong settings. You can tell us why you need to enter factory settings, so that we can help you better. Does it come with back camera when it is put on reverse? This w204 gps unit supports back up camera video input(camera is optional), it will automatically display after you put in reverse gear. Is it possible to fold this unit down or is it always visble? The new screen is always visble. 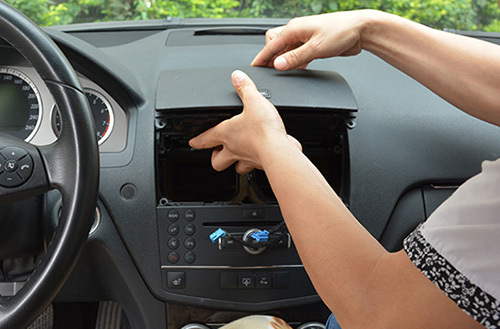 You can put the main unit in the glove box or any other position where you can put into. yes, it fits and works with w204 with 7 inch fold down screen models as well. My unit has been plugged in the car, The problem is not yet able to play DVD and the gps sound is still out along with the radio sound. Incidentally my car does not have a voice button, what should I do? If there’s not a voice button from steering wheel controls, gps sound can not come out from the small speaker which included in the package. As for DVD function, if you did not choose DVD player option, there’s no DVD function available, since you can keep using factory CD player and you can also play videos through USB or SD, so DVD function is not necessary. You can print this page directly. I have got no sound from new unit. My old radio sound is ok.
What do I need to do with the 2 male phono plugs coming from the centre of the main wiring harness ? 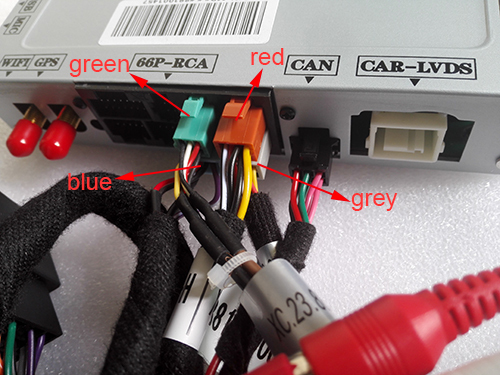 You can check if your aux wires matches the new ones, if not, then you can connect your aux wires with the new aux wires directly, red/black/white color in a group. Or use our Aux adapter cable to connect your aux port to get sound. In which socket on the android control unit, does your Aux adapter cable, plug into, and how many pins does it have ? You can check the blue socket plugged into the android control unit, the Aux adapter cable also comes with blue plug to connect the same connector. How much does your Aux adapter cable cost + cheapest delivery cost (No rush) ? Is it on eBay ? Why no sound from small speaker/buzzer, even from the Navigation App (IGO version 9), which comes with this unit? My car has FACTORY radar, parking assist sensors, but no reversing camera, Audio 50, with simple DVD Navigation. The cable is US$15, shipping cost is US$10 by hongkong post, if you need you can contact us to order one, but we can not guarantee if it works with your unit or not as you did not buy the Android w204 unit from us.